SAN DIEGO The Marine Corps released the names Thursday night of the four Marines killed while clearing unexploded ordnance at the base Wednesday. Two of the men were from California: 28-year-old Staff Sgt. Mathew R. Marsh of Long Beach, who had been a Marine since 2003, and 27-year-old Sgt. Miguel Ortiz of Vista, a Marine since 2006. Also killed were 31-year-old Gunnery Sgt. J. Mullins of Bayou L'Ourse, La., an 11-year Marine Corps veteran, and 32-year-old Staff Sgt. Eric W. Summers of Poplar Bluff, Mo., who has been in the Marine Corps for 13 years. The Corps also said one Navy hospital corpsman and two Marines near the accident scene had minor injuries. The four Marines who died were bomb removal technicians. The job is the most dangerous in the Marine Corps, and it is one of the few positions in which the Corps allows team members to quit at any time. That's because their mental focus could mean the difference between life or death, either for themselves or their fellow troops. Few quit, despite the inherent risks that come with finding and getting rid of unexploded munitions - whether on the battlefield or on a U.S. base, according to former bomb technicians. 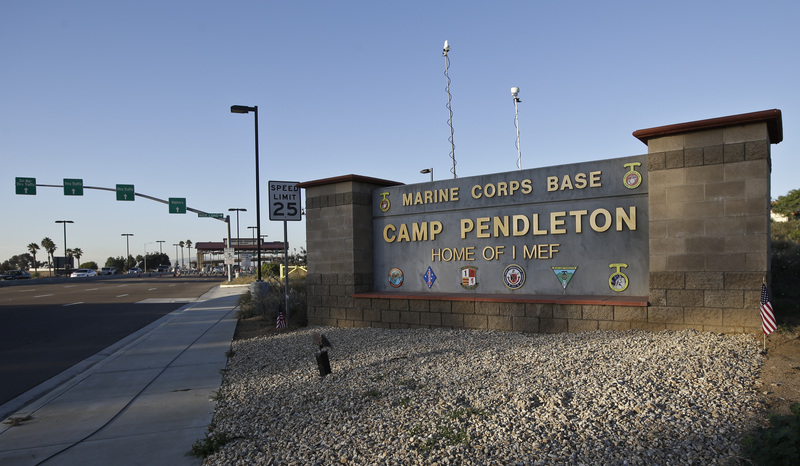 The four were killed around 11 a.m. during a routine sweep to make a range safer for future training exercises at Camp Pendleton in San Diego County, said a Marine official who spoke on condition of anonymity because he was not authorized to speak publicly. There was no live firing on the range at the time. Base officials said they would not release further details until an investigation into the cause of the accident is concluded. The Corps currently has 715 explosive ordnance disposal technicians. During the Iraq war, Marines lost 20 bomb technicians, and another 24 have been killed in Afghanistan. Retired Marine Gunnery Sgt. Brian Meyer said he was drawn to the job because of the challenge. Bomb technicians work in a team but are often entrusted to make decisions in the field on their own, such as whether it is safe enough to move unexploded ordnance or diffuse a roadside bomb. Meyer was injured while trying to dispose of an IED in Helmand Province in Afghanistan on March 14, 2011. The homemade bomb blew off his right hand, right leg and three fingers on his left hand. He's lost more than a dozen fellow bomb technicians and knows about 15 others who have suffered injuries, like himself. "It's hard to pick out one specific reason why I wanted to do this job," he said, adding that he would do it all again. "It's not a job in which you call your supervisor to make a decision. You're often the expert. You make the calls and work independently. There's a lot of trust placed in you. You're part of an elite group." Those who become bomb technicians must serve a minimum of four years in the Marine Corps. They undergo vigorous mental and physical screenings. The military scrutinizes their personal lives, checking to make sure they do not have any legal issues or other problems that could affect their job performance, said Capt. Maureen Krebs, a Marine Corps spokeswoman. "They really only take the most highly qualified Marine since they will be keeping their fellow Marines safe," she said. "If at any time there's an issue, like someone has PTSD (post-traumatic stress disorder), or is going through a divorce, they can ask to be removed because obviously safety is huge for this community." The Marine Corps does not have a shortage of candidates to fill the slots, Krebs said. Meyer said the job is "exhilarating." It requires math, problem-solving, and quick thinking. Some use bomb suits to protect themselves, but the suits can also pose more of a risk because they are cumbersome and easy to trip in out in the field, where technicians have to carefully tread among buried ordnance, Meyer said. And, he added, they cannot protect against being hit by a direct explosion. The team usually decides those details depending on the situation, said Meyer, who cleared a range at Pendleton in 2010. Explosives on artillery ranges on bases can vary in size, and clearing ranges can be as dangerous as diffusing bombs on the battlefield, Meyer said. Usually, the team marks a point from A to B, deciding what's movable and what's not. The team will group together the movable explosives, and then detonate them. "With unexploded ordnance, you can do everything right and stuff can still go sideways only because it's all so unpredictable," he said.